Artichokes with Creamy Balsamic Vinaigrette, Thyme for Cooking. The artichokes take 40 - 50 minutes to steam. This can be done anytime and the artichokes can be served warm or cold. Have a small, sharp knife handy so that when you get all of the leaves off and are at the fuzzy choke you can cut it off and enjoy the bottom.... and put an extra bowl on the table for the 'used' leaves. Cut off bottoms of artichokes and remove any tough lower leaves. Dip in water to which a tbs of lemon juice has been added (to prevent discoloration). For a nicer presentation cut off the tips of the bottom half of the leaves - using a scissors. Cut the top 1/3rd of the artichoke off and discard. Don't worry about the choke (fuzzy hairs inside). Put in a steamer and steam 40 - 50 minutes. 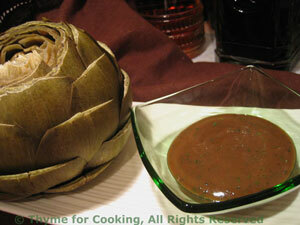 Serve artichokes with small dipping bowl of vinaigrette. In a small bowl whisk mustard and vinegar. Slowly whisk in oil until it emulsifies (thickens and combines). Add herbs and stir well to combine.